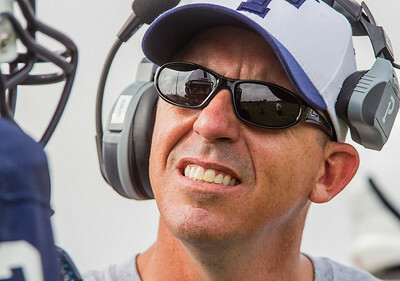 Kyle Grillot - kgrillot@shawmedia.com Cary-Grove head coach Brad Seaburg talks with junior Jason Gregoire during the second quarter of the high school football game against McHenry Saturday, October 5, 2013. 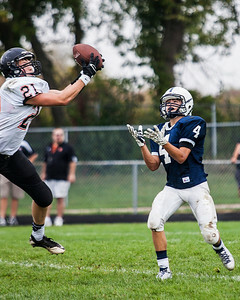 Kyle Grillot - kgrillot@shawmedia.com McHenry junior Scott Marunde nearly intercepts a ball intended for Cary Grove junior Larkin Hanselmann during the second quarter of the high school football game against McHenry Saturday, October 5, 2013. 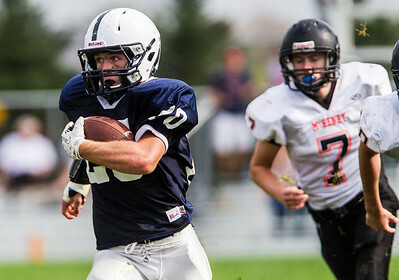 Kyle Grillot - kgrillot@shawmedia.com Cary-Grove junior Scott Marunde runs the ball during the second quarter of the high school football game against McHenry Saturday, October 5, 2013. 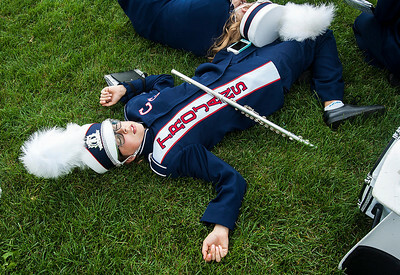 Kyle Grillot - kgrillot@shawmedia.com Cary-Grove junior Amanda Heggem takes a moment to rest before the half time show during the high school football game against McHenry Saturday, October 5, 2013. 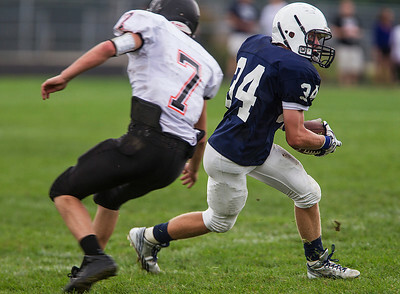 Kyle Grillot - kgrillot@shawmedia.com Cary-Grove junior George Hartke (34) runs the ball under the defense of McHenry Troy McClaughry (7) during the second quarter of the high school football game Saturday, October 5, 2013. Kyle Grillot - kgrillot@shawmedia.com Cary-Grove alum Jamie Meyer dances on the field to the Cary-Grove fight song during half time of the high school football game against McHenry Saturday, October 5, 2013. Kyle Grillot - kgrillot@shawmedia.com Cary Grove junior Matt Sutherland (20) runs the ball in for a touchdown during the third quarter of the high school football game Saturday, October 5, 2013. Kyle Grillot - kgrillot@shawmedia.com McHenry junior Mike Briscoe pleas with a referee after being thrown to the ball without having the ball during the third quarter of the high school football game against Cary Grove Saturday, October 5, 2013. A personal foul was called on Cary-Grove. 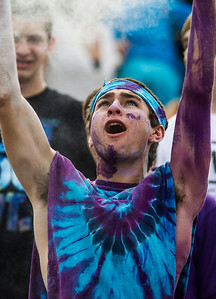 Kyle Grillot - kgrillot@shawmedia.com Cary-Grove senior Jack McGowan throws powder into the air at the start of the third quarter of the high school football game Saturday, October 5, 2013. 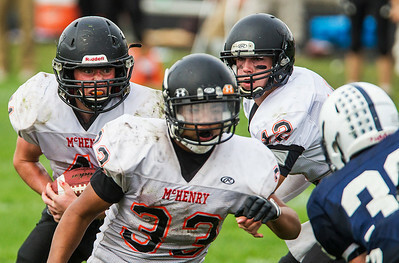 Kyle Grillot - kgrillot@shawmedia.com McHenry senior Thomas Hellios carries the ball during the fourth quarter of the high school football game against Cary Grove Saturday, October 5, 2013. Kyle Grillot - kgrillot@shawmedia.com The McHenry bench during the fourth quarter of the high school football game against McHenry Saturday, October 5, 2013. 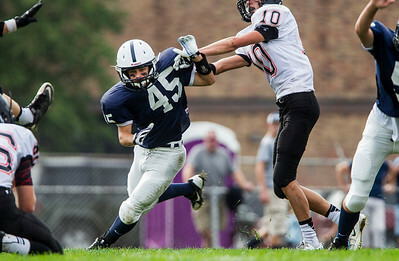 Kyle Grillot - kgrillot@shawmedia.com Cary-Grove junior Thomas Emma (45) attempts to block an extra point during the fourth quarter of the high school football game Saturday, October 5, 2013. 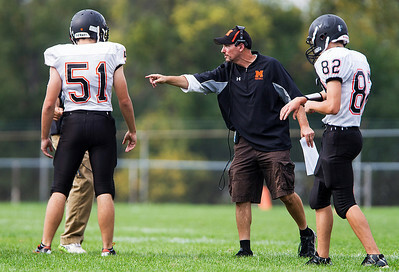 Kyle Grillot - kgrillot@shawmedia.com McHenry head coach Dave D’Angelo talks with his players during the fourth quarter of the high school football game Saturday, October 5, 2013. 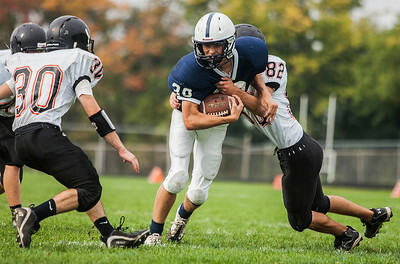 Kyle Grillot - kgrillot@shawmedia.com Cary-Grove junior Thor Halverson (30) is tackled by McHenry junior Jarrod Jablonski during the fourth quarter of the high school football game Saturday, October 5, 2013. Kyle Grillot - kgrillot@shawmedia.com Cary Grove junior Zach Forney (right) runs the ball in 7-yards for a touchdown during the fourth quarter of the high school football game against McHenry Saturday, October 5, 2013. 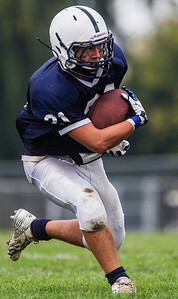 Cary-Grove won the game 48-14. McHenry junior Mike Briscoe pleas with a referee after being thrown to the ball without having the ball during the third quarter of the high school football game against Cary Grove Saturday, October 5, 2013. A personal foul was called on Cary-Grove.